West Village Community at University California Davis. In 2011 SWA built the nation’s largest planned Zero-Net Energy (ZNE) community. 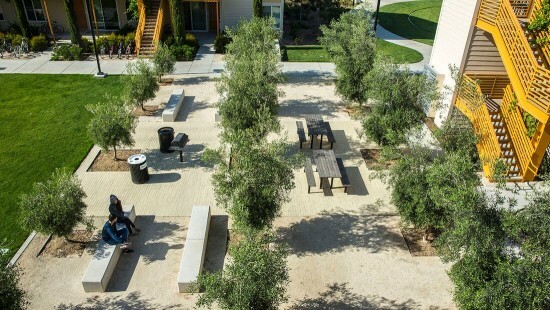 Working in collaboration with the University of California Davis and developer West Village Community Partnership (WVCP), the project houses over 2,000 students and 500 staff and faculty families. 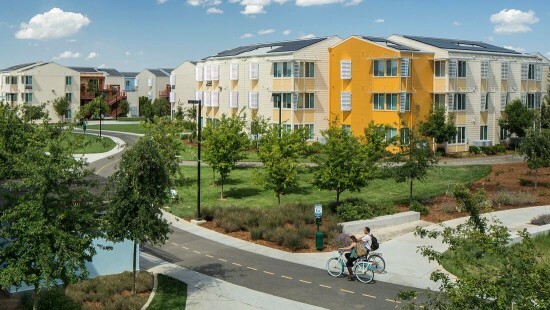 When UC Davis started the West Village Energy Initiative (WVEI) in cooperation with WVCP in 2003, the university initially only aimed for a 50percent reduction in energy consumption (compared to the California Energy Efficiency Building Code). However, in 2008 the initiative proposed that without losing quality and at no extra cost to the developer, West Village could become a ZNE community. 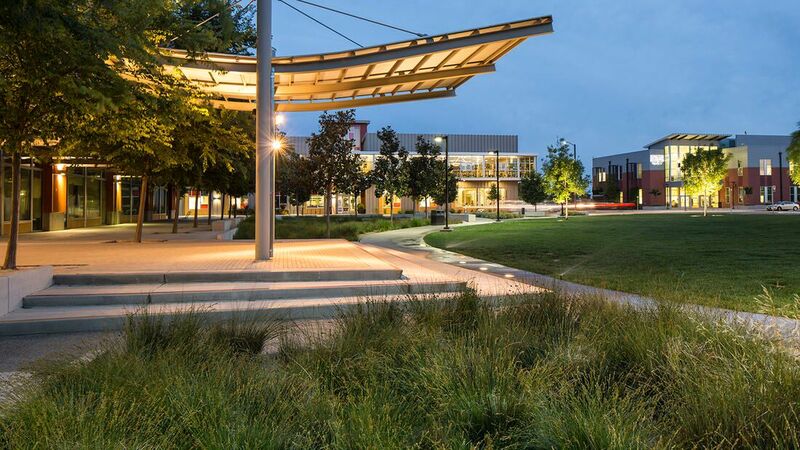 A public-private partnership with the developer and UC Davis has been able make WVEI’s 2008 proposal a reality. SWA master planned the 225-acre neighborhood and prepared landscape strategies for its development. Included in the housing scheme is a network of parks, storm water ponds and corridors, bicycle and pedestrian trails, a community college, and retail and recreational services. These areas incorporate on-site energy generation which are aesthetically designed and in harmony with local environmental conditions. In preparation, SWA conducted analyses at regional, site, and building/garden scales in order to maximize opportunities for passive cooling. Designers arranged buildings in loose clusters that allow breezes from the Bay Delta to filter through the site. SWA also proposed the planting of deciduous shade trees, reducing the need for air conditioning. In a bid to promote zero-energy methods of transportation, SWA integrated an extensive cycling network into the scheme making it the primary way of getting around the neighborhood. 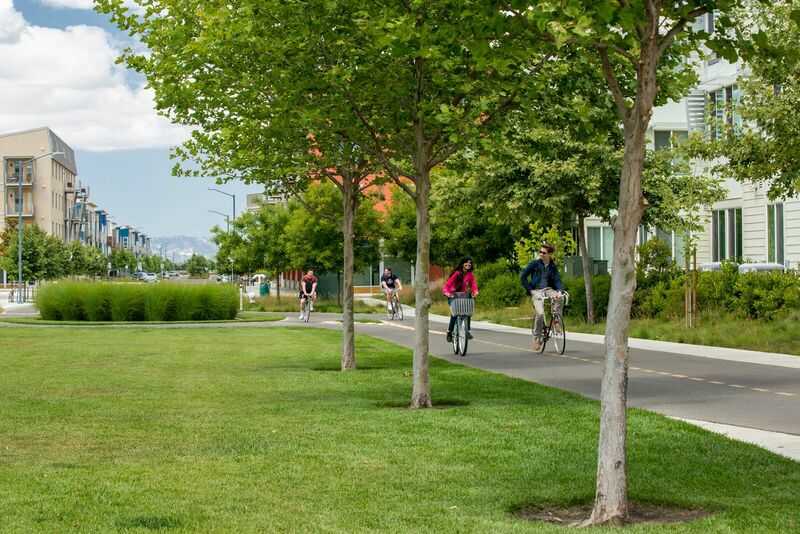 Davis is, after all, home to the first bike lane in the United States. 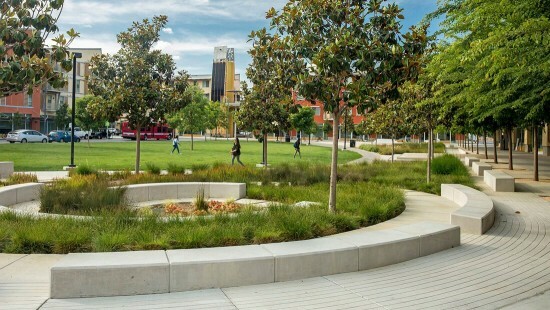 SWA integrated drainage into the site’s system of parks, sports fields, trails, and gardens. Storm water drains to the site’s large northern ponds, where it is purified by native wetland planting in a series of basins. The slopes of the site’s ponds incorporate native shrubs and trees, selected in cooperation with UC Davis’ horticulturists, botanical garden curators, and ground and maintenance personnel, to provide a sustainable habitat for migratory birds, while also providing a visually appealing natural landscape for residents year-round. UC Davis’ internal monitoring shows that the West Village ZNE community achieved an exceptional 87 percent of initial ZNE goals in its first year. In 2013, West Village received the ULI Global Award of Excellence, which honors outstanding development in both the private and public sectors, with an emphasis on responsible land use.